It's not possible to show weather at this moment. Very welcome to The Bonsai Garden 2004. If you have visited this site before you might see that a lot of things have changed, the whole site was redone from scratch, please read on to see what is new. If you prefer to continue reading in spanish, just click on the links above or choose your preferred language at any moment clicking on the flags at the footer of the page. 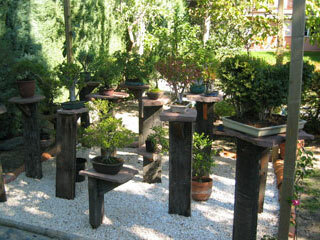 It's a very long time ago that I realized that I had to create a web page about one of my hobbies, the art of bonsai. Since I am involved in creating small trees for some years now, I thought it would be nice to share my still modest knowledge with other bonsai enthusiasts. Well, that was in the year 1999. In the meanwhile I have raised a handfull of little trees, not all "great" bonsais, but at least they are beautiful enough to be a joy for the sight, what I believe is in fact the main purpose of the bonsai art. I live in Madrid, Spain, where weather conditions are very extreme. In summertime, very high temperatures can be achieved (up to 40° Celsius) while the winters can be very cold (down to -5° Celsius). 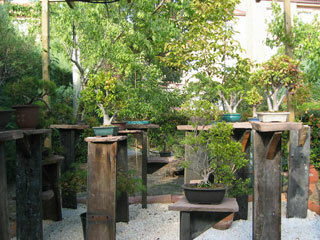 As you can imagine, raising bonsais, some of them tropical trees, in these conditions is quite complicated. The trees are sited in my garden under a wooden structure, covered by a black semi-translucent cloth in summer which I used to remove in autumn, spring and winter. I don't remove it any more as a wisteria sinensis has started to cover the whole structure. The site is also protected from two sides by a fence formed of Cupressus arizonica greene. The advantage of cultivating bonsai in Spain is the sun, omnipresent about 250 days a year, at least in mid- Spain where Madrid is located. A good growth is therefore ensured. Natural rain volume differs a lot from year to year as some years it rains a lot during autumn and winter with heavy showers in summer; the next two years are dry causing mean water shortage as the water reservoirs run out of water to soon now —Madrid is growing in size and population—. At least in my garden watering is ensured by a automatic rain system which I program depending on the season and temperature. In summer, besides the artificial micronized rain, I control the correct watering manually. I recommend the soft shower of Gardena which is a perfect substitute of the traditional japanese copper water can. 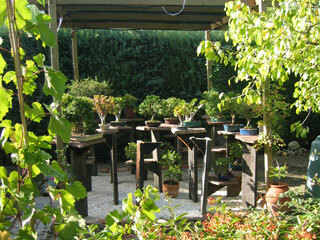 View of part of my collection sited in my garden with the trees protected by a sunroof and resting on little teak and stone tables. Autumn 2003. As most bonsai enthusiasts, I bought my first bonsai; it was a Serissa foetida which I still have, but now I prefer to raise my own plants or find interesting candidates in my preferred garden center. My hope for this page is that you enjoy your time, learn something new about bonsai or at least see a lot of beautiful pictures showing some of my modest creations. Another view, nice contrast between white gravel and green top. Autumn 2003. As mentioned at the beginning, I started this project back in june, 99 ... now it's more than five years later, a lot of things have changed, the previous site had suffered a lot of modifications and versions —so now the moment had come to redesign this site and offer new functionalities and up to date look, The Bonsai Garden 2004 is born—. The whole site was re-coded from scratch, new sections were added as ie. the forum, the RSS channels, more garden content is now available aso. All the contents are now available in english and spanish language. My intention is that you have the opportunity to collaborate as much as you want, so please check out the right column on every section.